USED WITH PERMISSION FROM American Patchwork & Quilting 2014. MEREDITH CORPORATION. ALL RIGHTS RESERVED. I really love this quilt. It’s the first time I have used any Liberty of London fabrics (all of the blues) and my first medallion quilt design. My local quilt guild member and friend, Lynette Reynolds, quilted it for me. Just take a look at the amazing work she did. Check out the calendar cover, isn’t it so cute? I love how they staged this shot, very patriotic! To celebrate my very first in print publication, I’ve decided to give away a calendar (complete with instructions on how to make each of the 12 projects in the calendar) to one lucky winner. All you have to do to enter the giveaway is leave a comment below. What a beautiful quilt and I agree with you the quilting is great. Thanks for a chance to win. Pretty quilt! Congratulations! What a stunning quilt! Thank you for the chance to win. Congratulations Calendar Girl! It’s such a wonderful quilt. Beautiful quilt. Blues are definately a favorite. 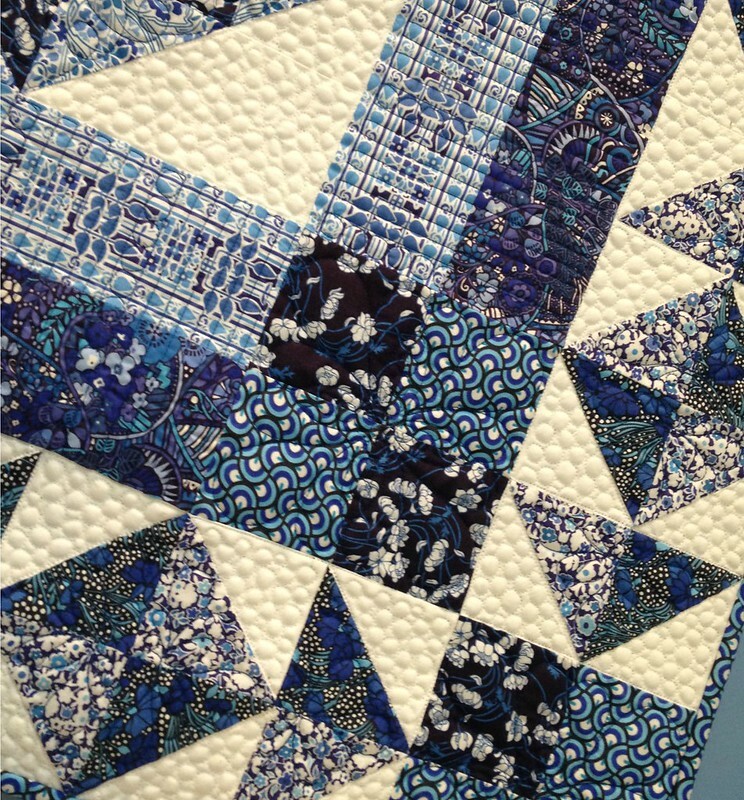 I love your quilt – the blue fabrics by Liberty are gorgeous. My favorite one is the Charles Rennie MacIntosh design. Your friend did a beautiful job of quilting it! Congratulations!! It is good to see how to use a medallion design and Blue…it’s my favorite color. The different patterns of quilting really help accentuate the pattern. Thanks for a chance to win a calendar. Please autograph your ‘Miss January” page. Congratulations on your first publication. Your work is very nice and I absolutely love the way you package your fabrics when purchased. Congratulations! Can’t wait to see it in the calendar! Your quilt is lovely and the quilting as well. Congratulations! Love medallion quilts and love yours!! Blue is my favorite color, I LOVE your wall hanging. You are so talented. Thank you for the chance to win!! I just love the January pin-up!!! Your quilt is a great way to start the new year. I would love to look at it over my ironing board. Thanks for the chance to win. What a beauty! I am hunting for a blue project… and this would be ideal. Thanks for sharing your success! I look forward to my new calendar every year. Your quilt is wonderful. How wonderful that you are published. Isn’t it a wonderful feeling. Your quilt is beautiful! I see why they wanted to publish it as “Miss January.” Love the quilting. Congrats! Oh, I would love to win! Thanks for the opportunity! Your quilt is beautiful! And, yes the quilting is outstanding. Of course blue is my favorite color. Thanks for the giveaway. Your quilt is beautiful! Congratulation on being in print. Thanks for the chance to win. Congratulations Amanda!! How exciting for you and definitely well deserved. I live reading your blog Ms Amanda! You do beautiful work. Can you enter the giveaway without having a wordpress blog? I can’t seem to figure that out. As one who loves blue and white I am sold. I love the red white and blue also. Thanks for the chance to win the calendar. Congratulations looking forward to this Calendar coming to my closest quilt store.Love the blue quilt. Congratulations on being included. That quilt is a beauty! What a lovely quilt. Quilt calendars are the best! 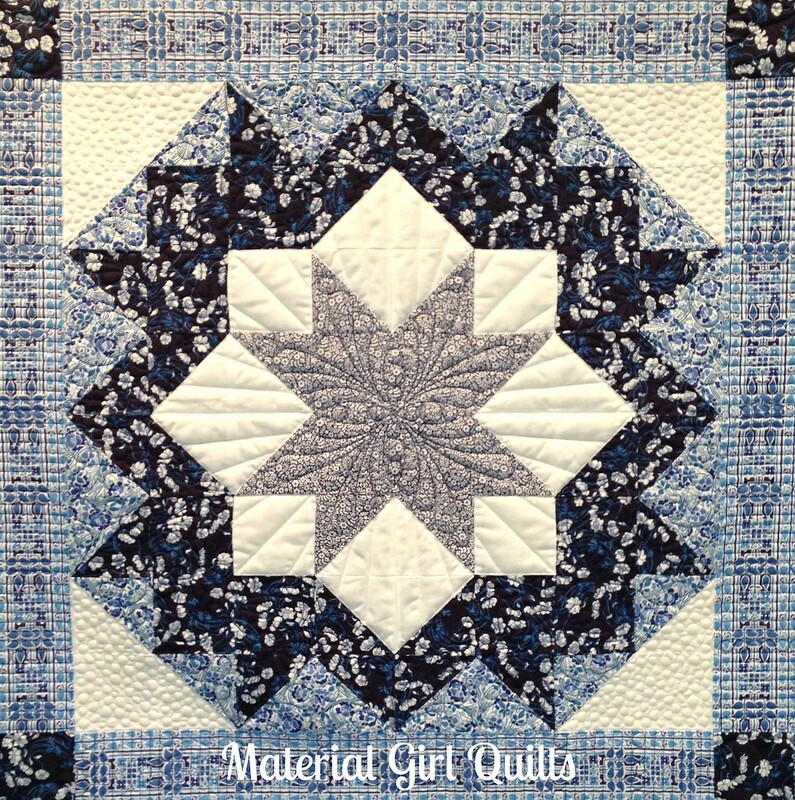 Gorgeous quilt, love the fabrics you’ve used and the amazing quilting – if only my pebbles were that good!! Off to practice…..
Lovely Quilt Amanda, so traditional and yet those Liberty fabrics just sing in it. Reminds me of my blue and white quilt, but of course yours looks so much better with the professional machine quilting! Lovely Pebbles. Congrats on the calendar and keep up the good work! Your quilt makes for an inspiring start to the year. Congrats. Gorgeous quilt. Always loved that color combination. Your quilt is beautiful! 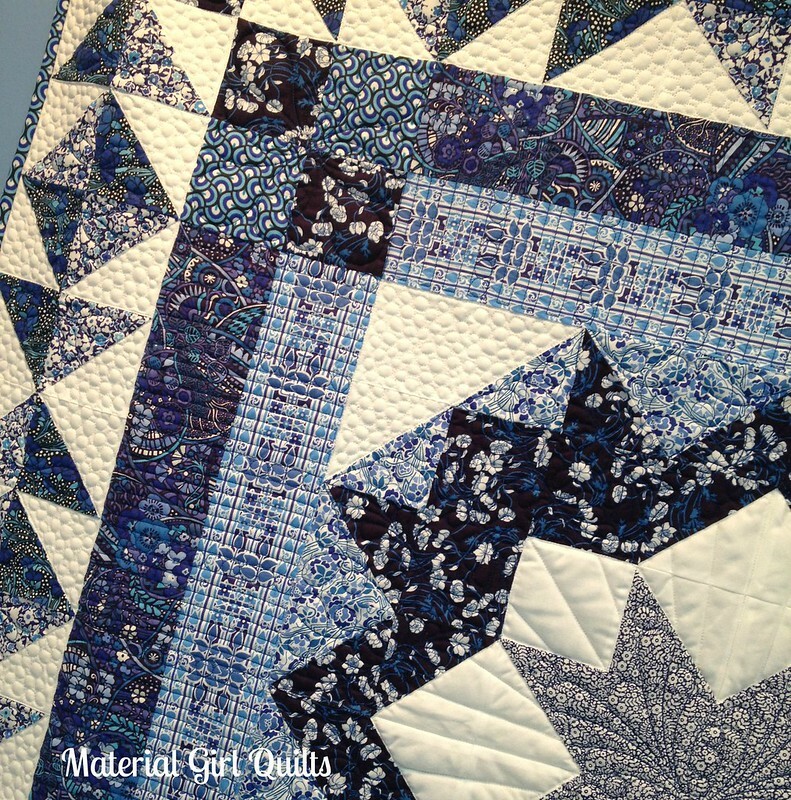 I’m always drawn to quilts in blues… It’s been my favorite for a long time. And yours is just gorgeous! Congrats on the publication! I hope you can tell us where this calender can be purchased. Congratulations on the publication. Your quilt is beautiful. I get 2 of these calendars every year. One for me and one for a friend. What an honor for you. But, of course, you make beautiful quilts worthy of it. I could stare at it for a long time, too. Such a pretty quilt! 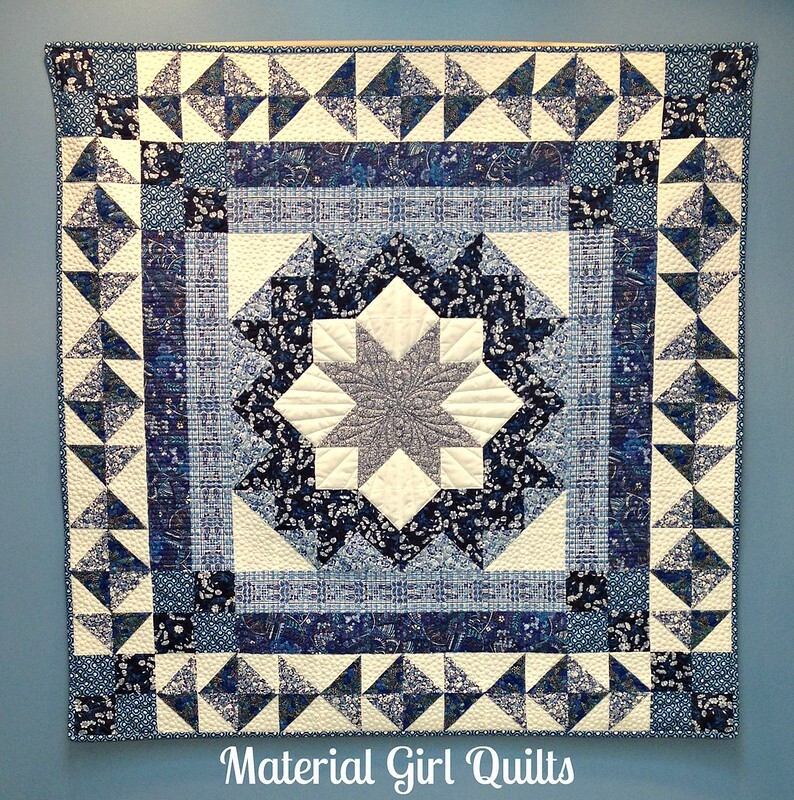 I was born in January, and love blue &white quilts! I love the medallion quilt. I made a sampler quilt with the medallion but still have not quilted it because I had no idea where to start. You have now given me some ideas so maybe it will come out of the unfinished projects box soon. Love your quilt, the blues really play well together. Very exciting!!!! Congratulations, you work is beautiful! Congrats – and the pattern and colors are great together. I enjoyed looking at all the quilting as well. If I don’t win (sad times) how can I purchase one? Congratulations on Miss January! Special congrats on having enough LoL to finish the quilt!! Congratulations – I love your quilt! That is really pretty & I am not crazy about blue!! oh my goodness, congrats on being a calendar girl and that is one beautiful quilt you made!! That is a lovely quilt and I’m sure the calendar is full of other beautiful projects! I hadn’t picked out my 2015 calendar yet but this looks gorgeous. Congrats on your quilt! Beautiful! So crisp and winters looking! Congratulations on being published! Love the quilts you’ve shown, would love to see the rest. Love your quilt-congratulations on being in the calendar!! The blues are so pretty. I had a calendar of quilts in my office last year, and it was the highlight of my work day sometimes, looking at them, and imagining how much fun it would be to make them! Ditto on loving the quilt. My all time favs are blue&white quilts and HST’s. This is stunning. I’d love to win,I’m sure the other 11 are great but I’m stuck on Jan.
Congratulations! Your quilt is beautiful – love the colors and the design. Amanda, such a beautiful quilt! The colors are gorgeous, as well as the quilting. Definitely adding this to my wish list! Your quilt is exquisite, Amanda. Congrats! Congrats! Well deserved, keep up the excellent work!!! Love the quilt! January is my favorite too, well my birthday may have a bit to do with that, and blue is fantastic! Congratulations Amanda, I can only imagine how exciting it must feel to be published. Great quilt. Love the blue and white. I am very into mini quilts these days, I haven’t made a medallion one yet. Love your design, and congrats on getting into the calendar! Congratulations! What an amazing quilt and amazing accomplishment! One of my favorite calendars! Great way to display our love of quilts! Congrats! Amanda! This is stunning with all the blues! Congratulations! I could see myself making this. I have ordered the calendar, but I have a friend who wants one also.